DFB Pokal where 64 best clubs from Germany participated. How much the winning team make from prize money in the match. Total 32 matches played in the start of the (German Cup) which is well known (DFB Pokal). Today we will discussed here how the prize money awarded to the clubs from Round 1 to final. The prize money increased for the winning club and the runner-up as they get extra paid for tv money. Bayern Munich is the most successful football club in the DFB Pokal. But current defending champions are (Borussia Dortmund) who win 2016-17 title after defeating Eintracht Frankfurt by (2-1) goals difference. In the first round there are 64 teams who play the matches. The prize money of €140,000 awarded among all the 32 teams who knocked out from the first round. In second round 32 teams who compete with each other, the losing 16 clubs will received the prize fund of (€268,000). 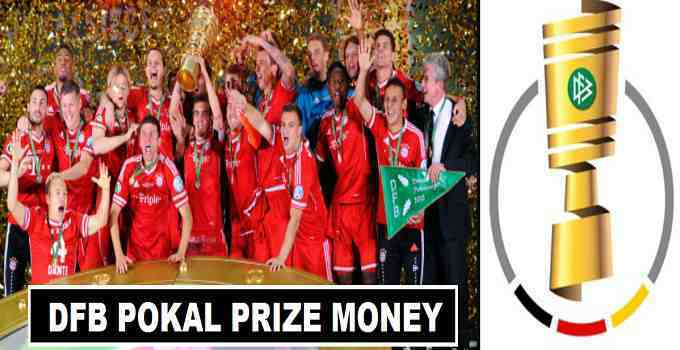 In third round the 8 clubs who face defeat will earn prize money of €527,000. The four clubs that suffer defeat in the quarter finals will received (€1.04 million) and semi final losing two teams will received (€2.07 million). No official announcement made how much prize money adjusted for the DFB Pokal 2017-18 winners. The above prize money mention in the table is estimated the winner of the cup will earn (€3.5 million). That include the tv revenue money. Team who lost the final match will earn (€2.2 million). But so far its just estimated amount given for the (runner-ups and winners share). Once the official details announced updated here.